The Social Work ASWB Bachelors Set includes the Bachelors Practice Test and the Bachelors Exam Guide by Dr. Dawn Apgar. 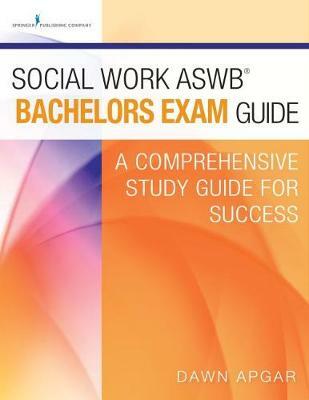 Students and social workers preparing for the social work bachelors licensure exam will find an invaluable study resource in both the Social Work ASWB® Bachelors Exam Guide and the Social Work ASWB® Bachelors Practice Test. Written by a prominent social work leader and trainer for social work licensing exams in the United States, these materials are based on years of time-tested exam prep workshops conducted by the author. The guide is comprehensive yet focuses on the material most likely to be included on the exam, so readers can prioritize information as they study. A self-assessment section helps identify strengths and weaknesses before tackling the material. The author shares her extensive knowledge of the exam by providing useful test-taking strategies and tips for overcoming test anxiety. Content includes human development, human behavior, diversity, assessment, direct and indirect practice, and professional values and ethics. The 170 questions contained in the full-length practice test with answers and rationales mirror the exam in length, structure, and content. These are unique questions, distinct from those in the author's companion study guide, that serve as a valuable diagnostic tool to improve exam success. With in-depth rationales and specific strategies for correctly answering each question, this resource helps social workers identify gaps in knowledge and errors in problem solving. Knowledge domains are grouped together so test-takers can identify the specific content area and competency being tested-a valuable asset for increasing understanding. In addition, the Knowledge, Skills, and Abilities statements (KSAs) are identified for each question, so test-takers can easily locate relevant source materials for further study. Tips for reading the questions, avoiding common pitfalls, and other valuable test-taking strategies, including an assessment of learning styles, add to this book's value as a highly useful resource and diagnostic tool. ASWB is a registered service mark of the Association of Social Work Boards, which neither sponsors nor endorses this product.